When you get your first two-wheeled freedom machine (aka motorcycle), it’s an awesome experience. I owned my first motorcycle in college. When I graduated, I quickly upgraded to another cruiser and used it daily to commute into the San Fernando Valley. One of the best things I ever did for my daily rides was purchase a good set of leather gloves. 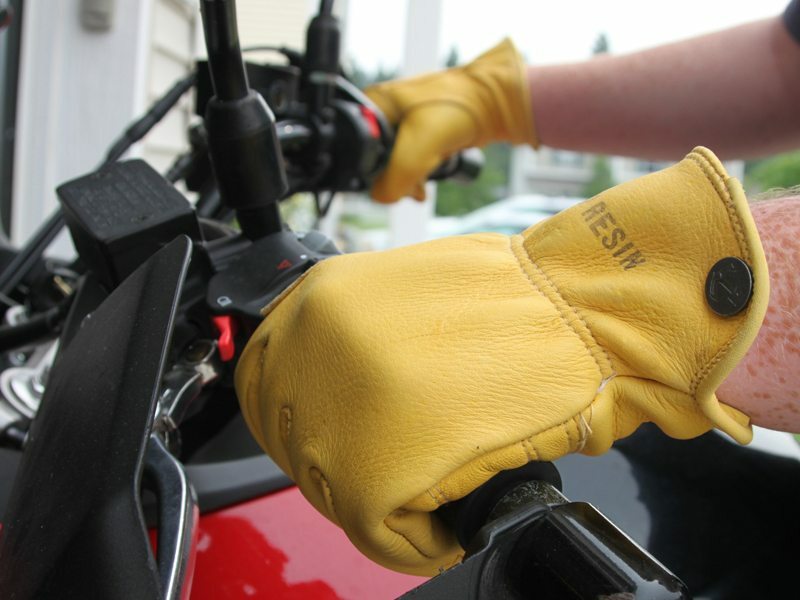 Of course gloves aren’t just for riding motorcycles…but some gloves just go with motorcycles better than others. Such is the case with the Iron & Resin Café Gloves. “Born in a small, Southern California, blue-collar beach town, graced with world class point breaks and seaside racetracks, where ghosts of a once towering oil industry still linger in the shadows. Iron & Resin is the brainchild of several friends who, after decades of collective experience building successful clothing brands, decided to turn back the clock and start anew. The result is a small, hand built collection of goods that draws heavily upon the founder’s own lifestyles and experiences. 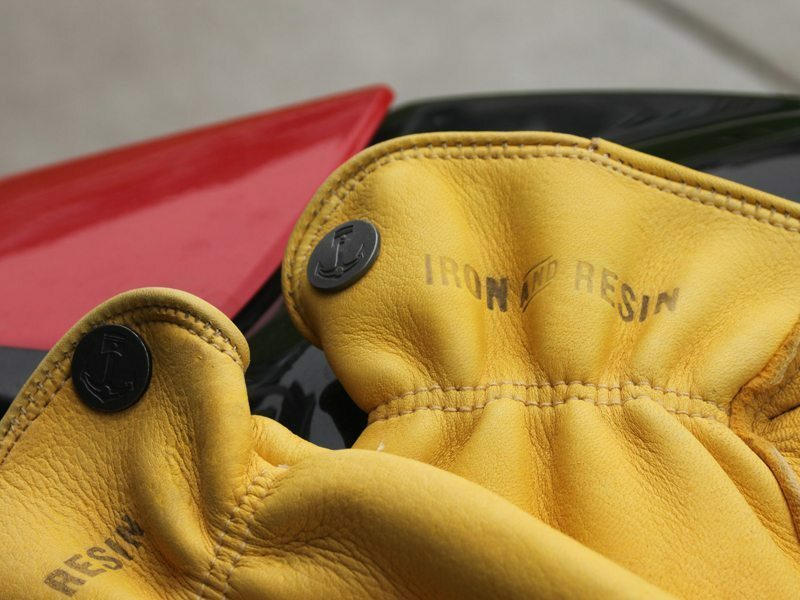 The Iron & Resin Café Gloves come in what they refer to as a ‘gold’ color. It’s an attractive color, but I’d say it’s more yellow than gold. But, I’m not going to nitpick. The gloves are 100% deerskin leather. If you’re not familiar with deerskin, it’s super soft; a fact that makes them ideal for gloves. Not only is it soft, but it’s durable too. The gloves are double stitched and feature an extra layer of leather across each palm. I received a pair in their extra large size and they fit perfectly. They’re snug in the right places and offer just the extra protection and insulation that I want when riding. And, their style affords me the ability to wear them off of my bike too. Their traditional look doesn’t look out of place with a good leather jacket on those cool mornings or evenings. On the motorcycle they are protective, yet soft enough to afford ease of movement and function while riding (which is extremely important). 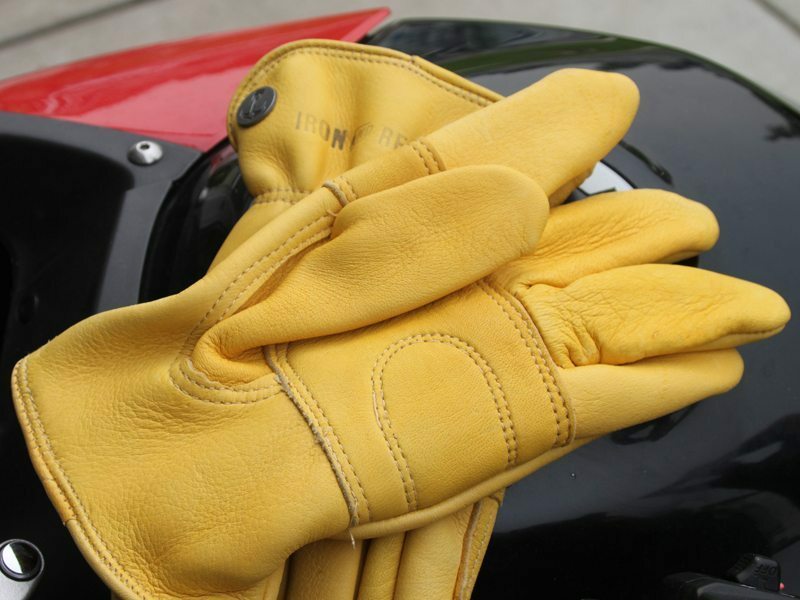 And riding is where these gloves truly belong…it’s part of the Iron & Resin DNA. 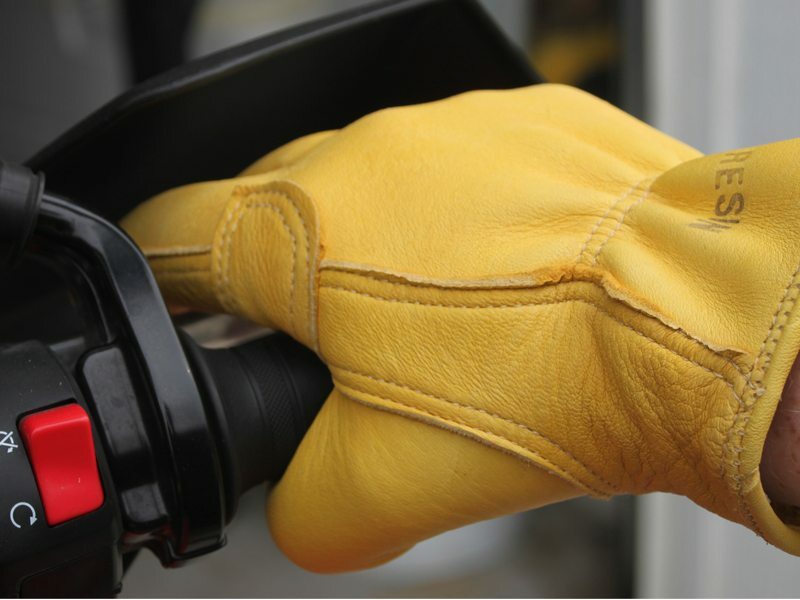 The first thing people do with these gloves is touch them…and comment on how soft the leather is. Then, of course they slip their hands inside and comment even more on the softness. Finally they ask, “where did you get these?” And, I happily suggest they visit the Iron & Resin website. 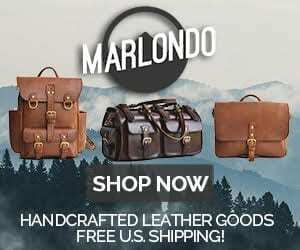 I also point out they have several different colors, leathers, and styles of gloves available (be looking for another BestLeather review on their Elk Bobber Gloves). The color of the Café Glove definitely draws attention. But, it’s the deerskin leather that really grabs people’s attention. The Iron & Resin logo name is stamped on both gloves and, in my opinion, gives them a cool, heritage look. They also have a piston and anchor logo pin in one of the gloves…another cool little feature. 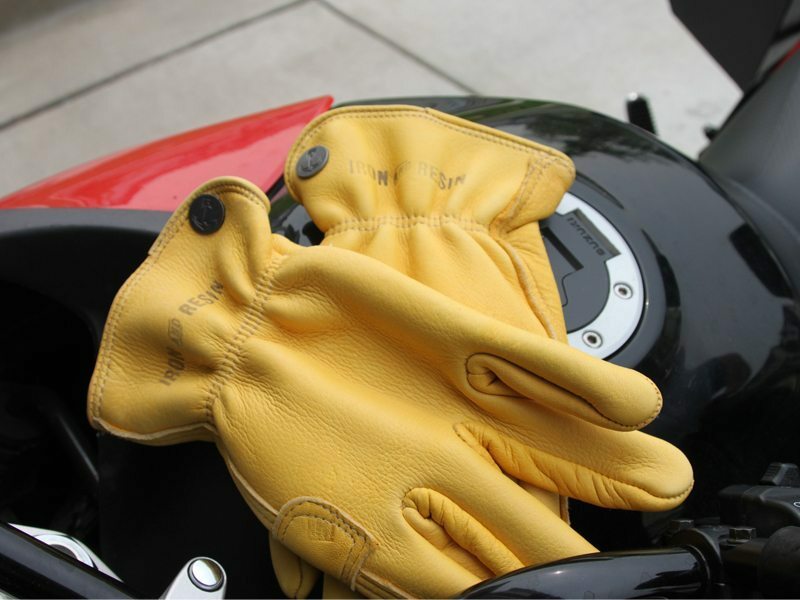 Even if I didn’t ride motorcycles, I would still be very interested in these gloves. I just like the style – I like the design – I really like the deerskin leather – and the fit and finish is ideal. 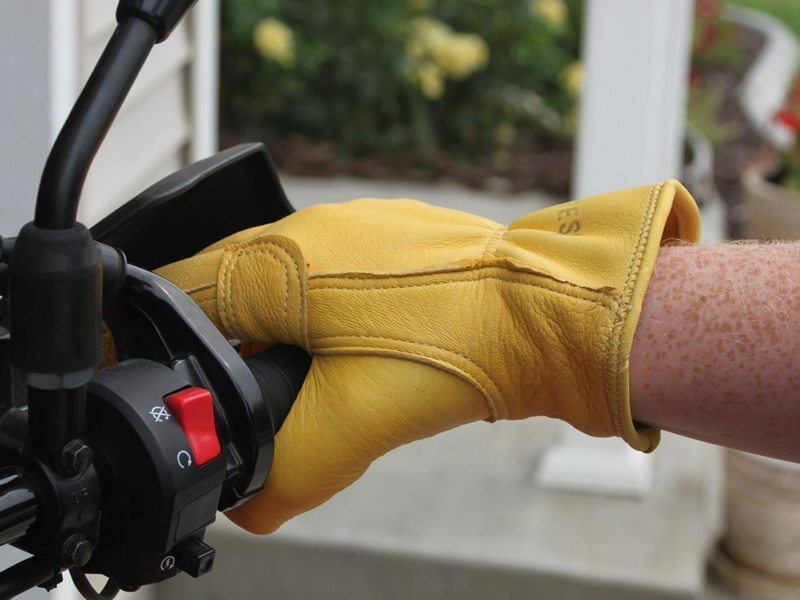 At $72 the Iron & Resin Café Gloves are a bit more than you’ll spend on gloves from a big box store, but the quality, style, and ‘cool factor’ is unrivaled. I look forward to using them on most every ride from here on out.